Insurance – specifically Property Casualty Insurance – is the industry that I have worked within for the last twelve years. During this time, I managed teams spanning IT, Finance and Operations. However the successes that I am most proud of have been in the related fields of Business Intelligence and Cultural Transformation that appear in the title of this blog. I have described various aspects of this work elsewhere, for example in The EMIR Project and my collection of articles on Cultural Transformation. I have also written about the general benefits of good Business Intelligence for any organisation. This article focuses on the business benefits of BI that are specific to the Insurance industry. Once upon a time there were 11 men; each of them owned a pig. ‘Could you each afford £10 for a new pig if your pig died?’ asked the wise man. They all agreed that they could manage that. ‘Very well,’ said the wise man. ‘If you each give me £10, I’ll buy you a pig if yours dies this year.’ They all agreed. That year one pig did die. The price of pigs had gone up to £95 by now, but the wise man replaced the pig, so none of the men suffered and the wise man had £5 left for the trouble and risk he had taken. Of course in the above example, there were two crucial factors for the wise man. First the outcome that only one pig actually died; if instead there had been two pig-related fatalities, the perhaps less-wise man would have been out-of-pocket by £90. Second, the related issue of him setting the price of the pig Insurance policy at £10; if it had been set at £9 he would again have suffered a loss. It is clear that it takes a wise man to make accurate predictions about future events and charge accordingly. In essence this is one thing that makes Insurance different to many other areas of business. If you work in manufacturing, your job will of course have many challenges, but determining how much it costs to make one of your products should not be one of them. The constituent costs are mostly known and relatively easy to add up. They might include things such as: raw materials and parts; factory space and machinery; energy; staff salaries and benefits; marketing and advertising; and distribution. Knowing these amounts, it should be possible to price a product in such a way that revenue from sales normally exceeds costs of production. In Insurance a very large part of the cost of production is, by definition, not known at the point at which prices are set. This is the amount that will eventually be paid out in claims; how many new pigs will need to be bought in the example above. If you consider areas such as asbestosis, it can immediately be seen that the cost of Insurance policies may be spread over many years or even decades. The only way to predict the eventual costs of an Insurance product with any degree of confidence, and thereby set its price, is to rely upon historical information to make informed predictions about future claims activity. By itself, this aspect of Insurance places enormous emphasis on the availability of quality information to drive decisions, but there are other aspects of Insurance that reinforce this basic need. In most areas of commerce the issue of how you get your product to market is a very important one. In Insurance, there are a range of questions in this area. Do you work with brokers or direct with customers? Do you partner with a third party – e.g. a bank, a supermarket or an association – to reach their customers? Even for Insurance companies that mostly or exclusively work with brokers, which brokers? The broker community is diverse ranging from the large multinational brokers; to middle-sized organisations, that are nevertheless players in a given country or line of business; and to small independent brokers, with a given specialism or access to a niche market. Which segment should an Insurance company operate with, or should it deal with all sectors, but in different ways? The way to determine an effective broker strategy is again through information about how these relationships have performed and in which ways they are trending. Sharing elements of this type of high-quality information with brokers (of course just about the business placed with them) is also a good way to deepen business relationships and positions the Insurer as a company that really understands the risks that it is underwriting. At the beginning of this article I stated that Insurance is all about risk. As in the pig fable, it is about policy holders reducing their risk by transferring this to an Insurance company that pools these with other risks. External factors can impinge on this risk transfer. Hurricane season is is always a time of concern for Insurance companies with US property exposures, but over the last few years we have had our share of weather-related problems in Europe as well. The area of climate change is one that directly impinges upon Insurers and better understanding its potential impact is a major challenge for them. With markets, companies, supply-chains and even labour becoming more global, Insurance programmes increasingly cover multiple countries and Insurance companies need to be present in more places (generally a policy covering risks in a country has to be written by a company – or subsidiary – based in that country). This means that Insurance professionals can depend less on first-hand experience of risks that may be on the other side of the world and instead need reliable and consistent information about trends in books of business. The increasingly global aspect of Insurance also brings into focus different legal and regulatory regimes, which both directly impinge on Insurers and change the profile of risks faced by their customers. As we are experiencing in the current economic crisis, legal and regulatory regimes can sometimes change rapidly, altering exposures and impacting on pricing. The present economic situation affects Insurance in the same ways that it does all companies, but there are also some specific Insurance challenges. First of all, with the value of companies declining in most markets, there is likely to be an uptick in litigation, leading to an increase in claims against Directors and Officers policies. Also falling property values mean that less Insurance is required to cover houses and factories, leading to a contraction in the market. Declining returns in equity and fixed income markets mean that one element of Insurance income – the return on premiums invested in the period between them being received and any claims being paid out – has become much less. So shifts in climate, legal and regulatory regimes and economic conditions all present challenges in how risk is managed; further stressing the importance of excellent business intelligence in Insurnace. If this litany of problems was not enough to convince the reader of the necessity of good information in Insurance, there is one further issue which makes managing all of the above issues even more complex. This is the fact that Insurance is a cyclical industry. The above chart (which I put together based on data from Tillinghast) shows the performance of the London Marine Insurance market as a whole between 1985 to 2002. If you picked any other market in any other location, you would get a similar sinusoidal curve, though there might well be phase differences as the cycles for different types of Insurance are not all in lock-step. To help readers without a background in Insurance, the ratio displayed is essentially a measure of the amount of money going out of an Insurance Company (mostly its operating expenses plus claims) divided by the amount of money coming in (mostly Insurance premiums). This is called the combined ratio. A combined ratio less than 100% broadly indicates a profit and one above 100% broadly indicates a loss. 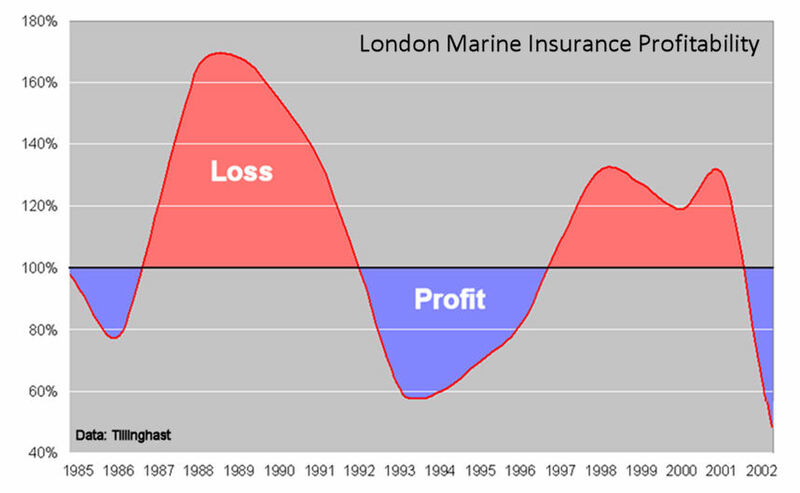 It may be seen that the London Marine market as a whole has swung from profit to loss, to profit, to loss and back to profit over these 18 years. This article won’t cover the drivers of this phenomenon in any detail, but one factor is that when profits are being made, more capital is sucked into the market, which increases capacity, drives down costs and eventually erodes profitability. As with many things in life rather than stopping at break-even, this process overshoots resulting in losses and the withdrawal of capital. Prices then rise and profitability returns, starting a new cycle. Given this environmental background to the Insurance business, it is obvious that it is very important to an Insurance company to work out its whereabouts in the cycle at any time. It is particularly crucial to anticipate turning points because this is when corporate strategies may need to change very rapidly. There may be a great opportunity for defence to change to attack, alternatively a previously expansionary strategy may need to be reined in order to weather a more trying business climate. In order to make predictions about the future direction of the cycle, there is no substitute for having good information and using this to make sound analyses. I hope that the article has managed to convey some of the special challenges faced by Insurance companies and why many of these dramatically increase the value of good business intelligence. Essentially Insurance is all about making good decisions. Should I underwrite this newly presented risk? Should I renew an existing policy or not? What price should I set for a policy? When should I walk away from business? When should I aggressively expand? All of these decisions are wholly dependent on having high-quality information and because of this business intelligence can have an even greater leverage in Insurance than in other areas of industry. Given this it is not unreasonable to state in closing that while good information is essential to any organisation, it is the very lifeblood of an Insurance company. My experience is that Business Intelligence offers the best way to meet these pressing business needs. Thank you for a look at the insurance industry from the perspective of an insider. Your concise summary of the key challenges of insurance is well written and readily conveys a broad view of the business. I don’t have anything to add, but I wanted to express gratitude for your publication of this material. P.S. Found this post by Google Image search for insurance cycle. Thank you for your kind comments and apologies for my very delayed acknowledgement of them. In fact I only came across them when linking back to this article today. I’m an Iranian.Thank you for your good content. Really enjoyed the pig story! You couldn’t have explained it better and in simpler terms what insurance is all about. Coming back to the point of insurance being all about making good decisions, I couldn’t agree more. And what are these good decisions based on? Obviously not on someone’s imagination, but on actionable data and information provided by business intelligence. It is, to borrow the author’s words, the lifeblood of an insurance company. Companies like MajescoMastek offer reliable insurance business intelligence solutions [http://www.majescomastek.com/it-services/business-intelligence-data-warehousing] that provide carriers the information they need to offer products and services aimed at driving growth. Alyssa – it did take you a while to post a link to a company, but I guess it was inevitable. Flattered that you think my little blog will boost traffic and sales I guess.